Charles Point Lighthouse | Lighthouses of Australia Inc.
Point Charles Lighthouse is the oldest in the Territory, built in 1893. Since settlement in 1870, the port at Darwin had always been difficult to navigate due to shallow waters, swift currents and many shoals, most of them uncharted. The South Australian Government had been pressured for years to build a lighthouse by mariners and others, but was loath to spend money for the distant Northern Territory. 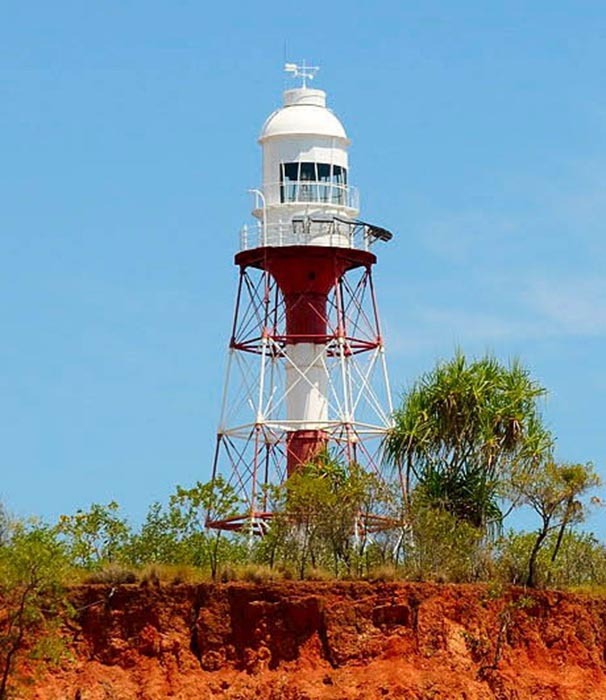 Nevertheless, construction on the NT’s first lighthouse began in 1892, at Charles Point on the northern end of the Cox Peninsula, 21 kilometres from Darwin. The wrought iron tower consisted of a central tube, almost two metres in diameter, braced and strutted. A spiral staircase in the tube led to the lanternroom, where a Chance Brothers revolving first-order dioptric optic using a vapourised kerosene burner with incandescent mantle was installed. The light began operating in 1893, showed a green, white and red light. The focal plane was 26 metres about ground, and 36 metres above sea level, enabling the beam to be seen for 32 kilometres, and from Darwin itself. Lightkeepers cottages were also constructed, made of galvanised iron, with wooden floors and surrounded by verandahs to help with the heat. Construction Red and white lattice tower with white Chance Bros. 12'3'' lantern with flat/square glazing. The lighthouse grounn of Kiama.